How Can I Access A Mobile Crisis Response Team? 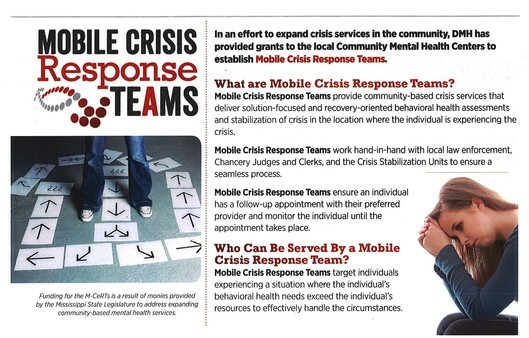 Individuals, families, law enforcement, clergy, ERs, chancery courts, and anyone concerned about an individual who is experiencing or at risk of a psychological crisis can request assistance from the Mobile Crisis Response Team. The Team is available 24 hours a day, seven days a week in Warren and Yazoo County. in Warren County call 601-638-0031. The Warren Yazoo Behavioral Health Mobile Crisis Response Team is available in Warren and Yazoo Counties is available 24 hours a day, 7 days a week. The Teams are able to respond to requests for crisis services related to acute symptoms of emotional distress. The nature of the crisis will determine the number of staff needed to respond. The Team accepts self-referrals, as well as referrals from family and friends, healthcare providers, law enforcement, emergency service personnel, and other service agencies. What are Mobile Crisis Response Teams? Mobile Crisis Response Teams provide community-based services that deliver solution-focused and recovery-oriented behavioral health assessments and stabilization of crisis in a safe location that serves the needs of the client. Ensure an individual has a follow-up appointment with their preferred provider and monitor the individual until the appointment takes place. The most fragile individuals are typically uninsured/underinsured, homeless and suffering from co-morbid medical and mental health issues, and therefore, tend to be the highest institutional, hospital and emergency department utilizers. Rather than treating them in the hospital emergency rooms or state psychiatric units, these consumers are best served using a community-based model where a collaboration of providers deliver intensive care and support, to collectively and creatively meet the needs of these individuals. The care coordination will serve to assist individuals who are not yet effectively connected with the services and supports that affect a person’s overall well-being and that help them to transition successfully from needing higher levels of care to effective community-based care. Coordinated care will link, retain, and support those who may need help taking their medications regularly, getting to their appointments on time, or coping with the psychological and emotional stresses surrounding their diagnosis. Intensive services can offer the right combination of direct and supportive services for each patient to provide stability and offer a safety net so that unexpected events do not have long-lasting negative health consequences. Other treatment and service approaches, including psychosocial rehabilitation, medication administration, community support services, individual therapy, and peer support services will support the individual’s recovery process as well, depending on the individual consumer’s needs and desires.